This article is about the quest. For the location, see Yngol Barrow. Find the treasure unlocked by the Coral Dragon Claw. Obtain a Coral Dragon Claw. "We need coin, Ranmir, and you're not bringing home any." Birna: "We need coin, Ranmir, and you're not bringing home any." Ranmir: "And you'd have me do what, join the College and prance about casting spells all day?" Birna: "Don't just walk away from me! Where do you think you're going?" Ranmir: "To the Inn for a drink, of course! Where else could I even go in this gods-forsaken town?" Birna: "And what, you think that'll solve all your problems?" Ranmir: "Probably not, but it's worth a try!" Obviously, Birna needs some profits, and during conversation she will mention a bad deal she made recently: "Yeah, it was stupid of me. I shouldn't have believed the story and just refused the trade. But I didn't, and now I'm stuck with this worthless junk." She will then tell the tale: "Some line about this claw thing and Yngol Barrow. He said it was worth more than its weight in gold if I took it back there. Something about placing it back in Yngol's chamber, I don't know. What was I thinking? Even if it were true, I'm not setting foot in some ancient tomb, filled with who knows what." She will then sell you the Coral Dragon Claw for 50 gold and leave you to find Yngol Barrow on your own. 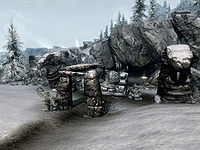 Alternatively, the claw can be found inside Yngol Barrow, before purchasing it from Birna. Nobody in Winterhold will guide you to the Barrow, as it is located much closer to Windhelm, where guards will provide directions and a bit of fair warning: "Across the river to the northeast lies Yngol Barrow. Steer clear of that foul place, lest the walking dead claim you as their own." Head northeast and follow the White River until you reach the Barrow on the eastern shore. The exterior of the Barrow is unguarded, but a strange altar with a few ingredients and the book Yngol and the Sea-Ghosts welcomes you. Reading through the book reveals that the Barrow is the final resting place of Ysgramor's son Yngol, who was killed by Sea-Ghosts during Ysgramor's return to Tamriel. The first tunnel is narrow and covered in ice so proceed forward until you reach a cauldron. A small beeping sound can be heard and a light-blue orb will jump up, following you around to lead the path. As you proceed forward another orb will soon join from a sarcophagus, then a third, all of them floating towards the same goal. Pull the handle and the gate will disappear, allowing access to yet another light-blue orb to join the party. Note that if you didn't buy the claw from Birna, a second claw will be sitting on the pedestal on the other side of the gate. Proceed forward through the empty tombs and icy passages and take a dive in the flooded room for a bit of minor treasure. When you reach a room overgrown with ferns, beware of the hidden pressure plate triggering a spike wall from the ceiling. As you reach the expected puzzle door, a total of eleven light-blue orbs will bounce around you, pointing towards the puzzle. Take a closer look at the claw for the correct combination, Snake—Wolf—Moth, and turn the rings to match. Insert the claw in the keyhole and watch as the door opens. The gate opens to a fluorescent room with a huge boss-leveled chest and a throne, facing away from you. As soon as you enter, Yngol's Shade breaks loose from the skeletal remains of Yngol and attacks. The shade is a boss-leveled draugr and can be as powerful as a dragon priest at higher levels. Depending on your level, he may have Unrelenting Force, Disarm, Frost Breath, and a Frost Cloak spell. His weapon is leveled, possibly enchanted, and can be either one- or two-handed. After the battle, loot the remains for valuables and search the boss-leveled chest for a healthy amount of gold and a copy of the rare Two-handed skill book Song Of Hrormir, then claim the Helm of Yngol from the skeleton in the throne. When you take it, the gate behind you will raise and provide easy access to a staircase and a door leading to the outside world. You can still purchase the Coral Dragon Claw from Birna even if you picked up the claw in the barrow first. However, once you've offered to buy the coral dragon claw from Birna (even if you didn't actually do so), the one in the barrow will disappear. The objectives for the quest are listed in the game files, but they're never set to display. This prevents any objectives from ever showing up in your journal. Additionally, it will not count in your statistics. If Dungeon Delving has sent you to Yngol Barrow, the Helm of Yngol and the skeleton it rests upon are completely missing. 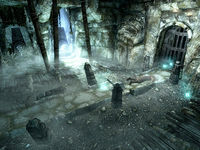 This issue has been addressed by version 2.0.4 of the Unofficial Skyrim Patch; Dungeon Delving will reserve the location and block this quest from running until it is completed. 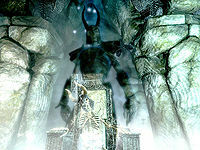 It is reported that the game spawns Yngol and his helm when you are near his throne. Thus, a possible workaround is to send a follower to retrieve the Helm of Winterhold from the final chest, then backtrack Yngol Barrow and finish Korir's favor quest by giving him the Helm of Winterhold. Then, go back to the barrow, and Yngol and his helm will be successfully spawned. Once the Helm of Winterhold has been returned to Jarl Korir, use the console commands pcb to clear the cell cache, and then ResetInterior YngolBarrow01 to make the dungeon respawn. Yngol's Shade and his helm should be at their correct location next time you enter, and you should be able to get out through the gate at the end. Yngol's Shade's inventory will activate automatically on re-entering the room and there will be no additional boss to fight. The following empty quest stages were omitted from the table: 10, 15, 49, 50, 100. On the PC, it is possible to use the console to advance through the quest by entering setstage dunYngolBarrowQST stage, where stage is the number of the stage you wish to complete. It is not possible to un-complete (i.e. go back) quest stages, but it is possible to clear all stages of the quest using resetquest dunYngolBarrowQST.